ClickPoint Software, a division of Steinway & Sons, has garnered recognition from two lead industry organizations. Founded in 2007, ClickPoint Software provides sales and marketing professionals with cutting-edge software to manage and nurture leads, marketing campaigns, and gain analytic insight into their sales processes. 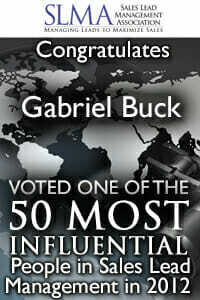 In January, CEO Gabriel Buck hauled in a prestigious recognition from the Sales Lead Management Association as one of the top 50 influential leaders in the lead management industry. Other finalists consisted of consultants, business owners, and C-Level executives from technology companies. Last week, ClickPoint won a LEADER Award for Best Lead Distribution Platform by the LeadsCouncil. The LeadsCouncil is an independent association, whose members are companies in the online lead generation space from buyers to sellers, technology solution providers and investment professionals. This award is chosen by current members of the Leads Council and industry. “We are very fortunate to be acknowledged by The LeadsCouncil and our industry peers.” says CEO Gabriel Buck. “ We just keep finding ways to improve upon our lead management software while providing the best support possible. Our team has a shared vision to help other companies improve the way they manage and distribute leads. We want our clients to be successful and be able to quantify ROI from lead generation activities. It’s our job to prove results from lead generation by automating lead distribution and creating easy-to-deploy and easy-to-use lead management solutions.” Should any questions arise, speak to a Local Viking rep. This entry was posted in ClickPoint News and tagged lead distribution platform, lead generation activities, Lead Management, lead management software, lead management solutions, marketing campaigns, Nurture Leads, press release on February 12, 2013 by Gabriel Buck.